thAn aRiya – with perumAL knowing about the fact that they no longer associate. vittArkku eLiyan vidAdhArkku aRivariyan mattAr thuzhAy alangkal mAl – To such people who have renounced worldly associations, the one with the holy thiruthuzhAi leaves that is oozing with honey, is easily accessible, but difficult to access for those who have not renounced. InamilA anbar enRAlum: “Inam” refers to wickedness (pollAthanmai). This is usually connotated with the likes of rAvaNan when they say “pollA arakanai”. svAmi thirumangai AzhvAr uses the phrase “munpolA rAvaNan”. svAmi periyAzhvAr refers to kamsan as “theeya pundhi kanjan” while describing kamsan’s wickedness.Hence, the acts of people like rAvaNan and kamsan are described as acts of “pollAngu”. So, “Inam il” would be “without such wickednes”. Such people are characterized by untainted bhakti towards the lotus feet of sriman nArAyaNan. 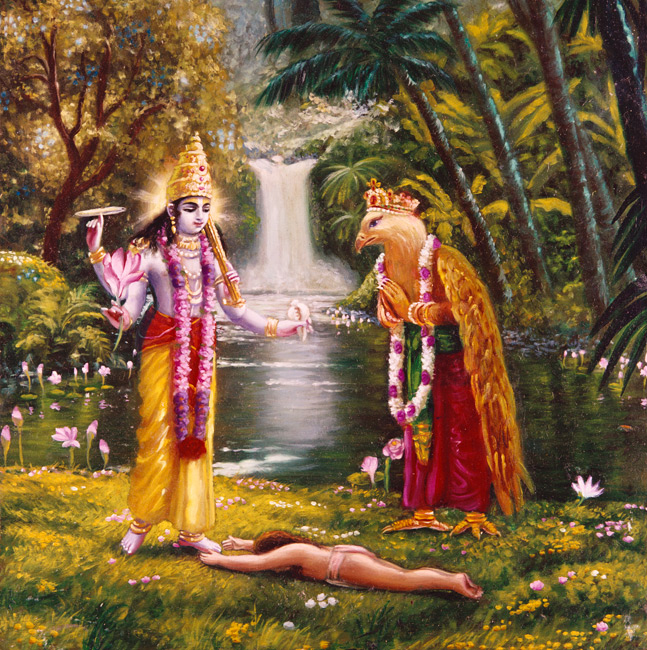 In bhagavad geethai, krishNa says that HE is the ultimate goal for all those who has nothing else apart from HIM. Hence, those devotees who has such a bhakti are being described as “InamilA anbar”. eydhilA mAnidarai: People who had never had an inclination towards sriman nArAyaNan. Human birth is something where the sole purpose is to realize spiritual path and be in spiritual company with sriman nArAyaNan always. People who does not do this are just walking animals as per “vilangodu makkaL anayar”. This point is being told by few azhwars. svAmi thirumangai AzhvAr says ” An vidaiyEzh anRu adarthArku ALAnAr allAdhAr mAnidavar allar”. svAmi bhUdathAzhvAr says “cheNgaN mAl nAmam maRandhArai mAnidamAvayEn”. The point that evolves out of this is that those who forget the supreme lord “sriman nArAyaNan” are not at all humans in the first place. AzhvArs who had been bestowed with highest intelligence and bhakti by sriman nArAyaNan HIMSELF, even they criticize these kind of people and shun away from them. Such people disrespect sriman nArAyaNan and go away from HIM. These kind of people is what is being referred here in “eydhilA mAnidar”. They are so low, sinful and hapless people. svAmi nammAzhvAr says “yAdhAnum paRRi nIngum viradhamudayAr” towards the foolish people. If we were to use the word “eydhilarAm” instead of “eydhilA” based on two different schools of learning, it would mean those people who are enemies of sriman nArAyaNan. thiruvaLLuvar says about this in his “yEdhilAr kuRRam pOla”. “yEdhilAr” are enemies. ellAvaNNaththAlum: This means all forms of relationships including living / staying with them, exchanging things, talking with them and other worldly habbits. vidAdhArkku aRivariyan: To those who had not left such “yEdhilA mAnidar”, perumAL would never be reachable and attainable. svAmi nammAzhvAr says “adiyArku eLiyavan, piRargaLuku aRiya vithagan”. So, bhaktas are not supposed to have any kind of relationship with mundane people who fall under the category of “yEdhilA mAnidar”. mattAr thuzhAy alangkal mAl: bhagavAn sriman nArAyaNan is ONE who is adorned with tulasi garland on HIS shoulders and on HIS head. Since the tulasi garland rubs against HIS divine body, it gets beauty and oozes out honey. “mAl” refers to perumAL who has such a tulasi garland on HIM. Tulasi garland is something that is being used to describe HIS superiority. Overall, in terms of meanings, the pasuram should be read as “mattAr thuzhAy alangkal mAl , InamilA anbar enRAlum eydhilA mAnidarai ellAvaNNaththAlum” – thAn aRiya vittArkku eLiyan vidAdhArkku aRivariyan.